I've been a fan and subscriber to an online community for years called Late-Stage Capitalism. I love the critiques posted there of free markets gone awry. I think this is an important issue of our time: the growing wealth gap, absurd marketing, awful worker conditions, the destruction of the planet for greater profits... These are issues that concern me, and I've found that this community has been a nice place for like-minded people. It hasn't felt the same lately. In this age of identity politics and tribal mindsets, the subreddit has become a depot for all things leftist. I still like most of the posts, and I don't really disagree with much of what far leftists fight for. But I'm finding that I have my limits. "Totally agree. But I'm not sure this is the right subreddit for it." So there it was. I was told to get out (by an apparent Viet Cong fan). I have also been banned from r/socialism for similar comments, which is why I referenced that. I guess I just fail to see the connection between economic models and other political topics that are especially sensitive these days! Aside from the annoyance of always seeing this wall of text under every post, I am annoyed that the community feels the need to be so controlling and rigid. I guess it's my own fault for inciting controversy in a supposed "safe space", but my point remains: I do not think this anti-Israel meme is directly connected to a critique of capitalism. Of course our economic model is tied to everything in life, but the USSR had plenty of geopolitical fights as well. Imperialism is simply not the same as disaster capitalism. 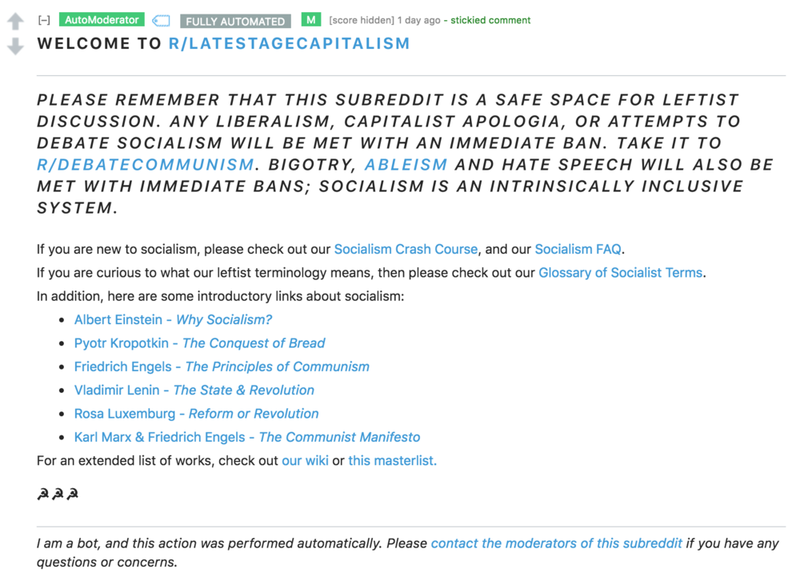 It's also ironic that "socialism is an intrinsically inclusive system" and yet this very subreddit cannot manage itself with compassion or acceptance. Any unfavorable opinion is met with harsh action, and this is somehow reflective of a healthy, inclusive atmosphere?? - Many "communists" feel like free speech is a made-up concept and is not important. Food, water, shelter and basic needs are important, and the state should only care about those things. Free speech is not something the state should protect or defend. This is very interesting to me. I personally feel like free speech/expression must indeed be defended, but I would happily here more from other perspectives. - Hate speech =/= Free speech. This whole thing. Suffice to say, I disagree with this logic. Who is to say what "hate speech" is? It is an erroneous term, way to diffuse to mean anything. It simply censors anyone with opinions one disagrees with. It equates to tyranny, either through totalitarianism or of the masses. - The issue of free speech within an online community. I attacked the user who banned me on the idea that he was censoring any and all healthy dissent by banning people who didn't agree with his moderating *enough*. Even the original user who said "Totally agree. But I'm not sure this is the right subreddit for it" was banned. Simply for questioning the mods. This reminds me of Stalin, who erased his comrades from photos once he disagreed with them too much (and had them killed), and who sent off most intellectuals to the gulags of Siberia. How is this a good thing? - The mod said to me that if I don't support the causes of social justice worldwide, and disenfranchised identities, I don't belong in LSC. I am deeply troubled by this, because it demonstrates how the left eats its own. I'm just not leftist enough, even though I want to harshly critique the USA's capitalist-run government. Apparently I'm no ally at all if I have nuanced opinions on other topics. *This* is the cover image of Late-Stage Capitalism. Actually relevant! The moderator also said that no defense of Israel is tolerated in his subreddit. How is this fair? Does it make any logical sense at all?? If it was r/Palestine, I could understand. But this is a subreddit about capitalism. - Israel-Palestine... Look: My heart goes out to victims of violence in general, but things are deeper than that. In war, perpetrators are also killed. Isn't it understandable? In my (liberal American) bubble, the narrative is simply that Israel kills innocent, unarmed protestors. That is simply not the full story. 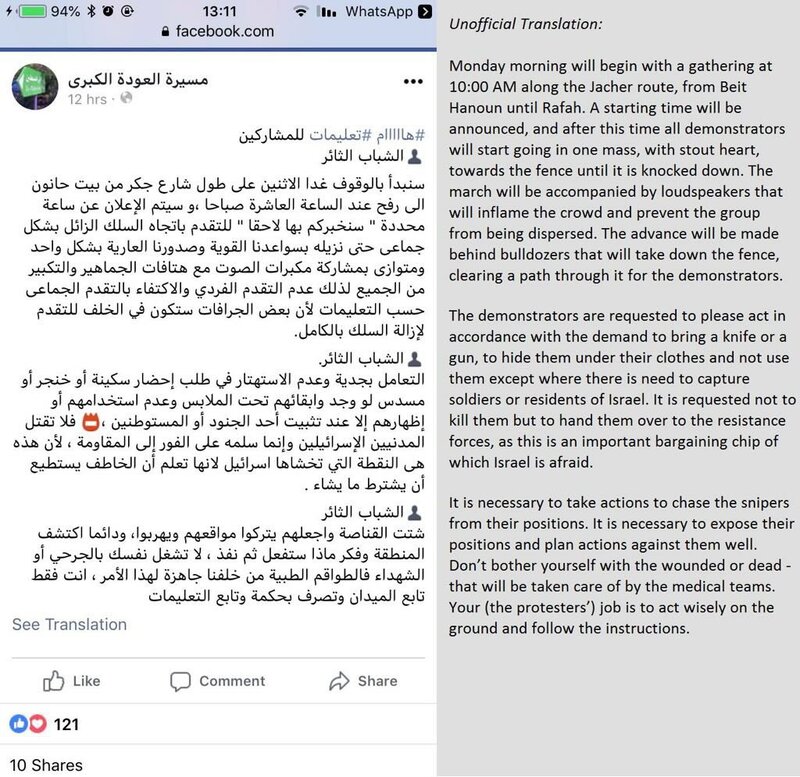 Palestinians in Gaza City, ruled by Hamas, are encouraged to incite unrest on the anniversary or their lost lands. These protests are not as non-violent as the media reports. Israel does indeed "defend itself" - it does not arbitrarily attack those at its borders. I have many problems with Israel. I am against religious states. I am against UN violations. I am against the idea that the allies of WWII can draw borders in lands they don't fully understand. But one has to acknowledge the hate, violence and vitriol hurled at Israel, and to appreciate the context in which these bursts of warfare occur. Palestine - Hamas in particular - wants Israel destroyed. They will not accept a two-state solution. They will not accept any proposed borders between the communities. They have indeed turned down peace agreements offered by Israel five times in the span of Israel's existence. I don't know what is right. The deep hatred of imperialist invaders felt by Palestinians makes sense to me - it's reminiscent of the Native Americans in the USA. But their idea of a solution does not make sense. What would that solution look like? Likely the death of all Israelis. Likely something akin to Sharia law. Is that really better? Better than the human rights protected by Israel? Better than its technological advances and contributions to science? Better than its commitment to Western ideals and cooperation? Somehow I do not think so. Victimhood is a tricky thing. It can be accepted and worn as a badge, like martyrdom. It can be overcome. Victimhood does not automatically earn my respect or sympathy. Am I a victim for being banned from a political subreddit (that I actually support most of the time)? I do feel like the victim of a tyrannical moderator, of irrational rules, of sensitive outbursts. And I do want my readers to acknowledge that sort of injustice. But ultimately, by writing this post, I am overcoming my victimhood status by outlining the problems as I see them, and if I really do have irreconcilable differences with r/latestagecapitalism, so be it.